Turangi is a small town on the west bank of the Tongariro River, 50 kilometres south-west of Taupo on the North Island Volcanic Plateau of New Zealand. It is part of the Waikato region. It was built to accommodate the workers associated with the Tongariro hydro-electric power development project and their families. The town was designed to remain as a small servicing centre for the exotic forest plantations south of Lake Taupo and for tourists. It is well known for its trout fishing. The major hapu of the Turangi area is Ngati Turangitukua. The Turangi area covers some 2273 km², and is located close to the edge of the Kaimanawa Ranges and ten kilometres north of the stretch of State Highway 1 known as the Desert Road. The streets around Turangi in autumn are lined with "brilliant" foliage. Built on the banks of the Tongariro River, Turangi and its surrounding countryside offers challenging hunting, fishing, mountain biking, hiking or leisurely bush walks, white water rafting, kayaking, sight seeing and much more. The town has a population of around 3500, and it is (after Taupo) the second largest population centre in the Taupo District. The Town's population peaked at 9000 during the 1970s. Since the end of the Project in the 1980s the population has declined but has remained stable due to the town's handy location for tourists. Tourism and forestry are the mainstay of the community with the Department of Corrections two prisons, Genesis Energy, the Department of Conservation and farming being the main employers. The area was settled by the people of Ngati Tuwharetoa, descendants of those who had originally settled in the Kawerau area. The major Tuwharetoa migration occurred from about the 16th Century with a warparty under command of Turangitukua who engaged in a number of battles against earlier inhabitants of the Taupo, Rotoaira and Kaimanawa area. Following these battles a variety of settlements were established in the area with major pa established on the cliff overlooking the Tongariro River and at Waitahanui on the Tongariro Delta. Another important settlement was at Tokaanu. The people who eventually become known as Ngati Turangitukua associate mainly with Waitahanui pa.
From here they established a number of homesteads along both sides of the Tongariro River and its tributaries. Including houses along the main Highway to Taumarunui (now Hirangi Road). In 1910 construction of a wharepuni begun which eventually became the Hirangi Marae complex. The first Europeans reached the Turangi area in the 1830s, however it was not until the 1850s that European settlement occurred with the construction of a Mission Station at Pukawa. In the 1880s and 1890s brown and rainbow trout were introduced of into the lake and rivers of the area. 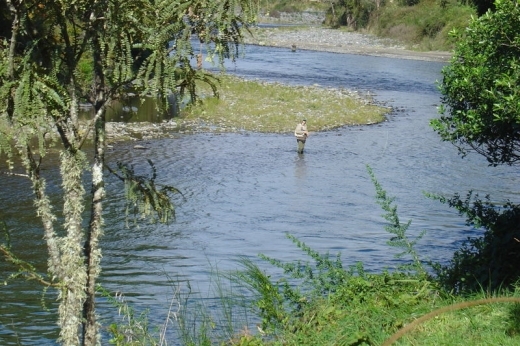 A small fishing camp was established at Taupahi on the Tongariro river bank (now Taupahi Road) and a number of European fisherman camped here. In the 1920s two prison farms were opened at Rangipo and Hautu because of the isolated nature of the area. It was also during this period that the Morar family arrived, migrants from India, who settled in the area establishing a store in Tokaanu. By 1960 the population was about 500. In the 1950s, in response to post World War II needs for rapid expansion of energy resources to meet the growing industrialisation in New Zealand, the Tongariro Power Scheme proposal was developed. The Scheme would require a large construction force, and have accommodation for that force, for the duration of the project. Four sites were considered for the township to accommodate the project workers: Rotoaira, Rangipo, Turangi West, and Turangi East. The tourist potential of Lake Taupo was appreciated, as well as the economic benefits that could be captured by creating a permanent township, if. Taken in account of: accessibility, climate, and adequacy of suitable land for development of a township, it was decided to go with the Turangi West site. Construction the town began late in 1964, the Government invested $16 million in the development By May 1966, the population of Turangi had jumped from 500 to 2,500 people and by 1968 the population reached a high of 6,500. A model town with curving streets and cul-de-sacs, uniform houses, pedestrian shopping centre, parking lots and separation from the traffic on the main highway was created. A publicity pamphlet published by the Ministry of Works in 1969 described Turangi at that time as a pleasant and attractive town of 5000 people which offered a 'balanced community life'. The pamphlet enumerated the town’s amenities, shops, and services, such as its mall, schools, sports facilities, library, maternity hospital, parks, and, not least, its wide, grassy verges and kerbing. The world famous Tongariro River, runs through the middle of the town. The town calls itself "The trout fishing capital of the world". A fisherman tries his luck.